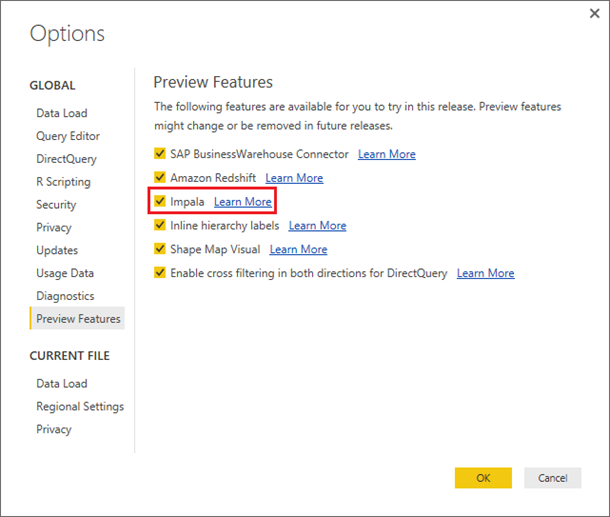 In the Power BI Desktop July Update, we have introduced a new Preview connector that allows users to easily bring data from Impala into their Power BI reports. In order to get access to this connector, users first need to enable this Preview feature. Preview features can be enabled via the Options dialog (File -> Options and Settings -> Options). The option to enable the Impala connector is available under the “Preview Features” tab in this dialog. 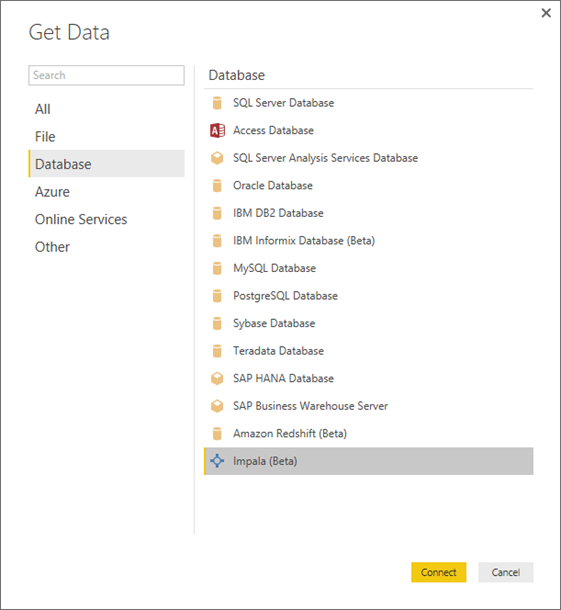 After enabling the feature, the Impala connector can be found within the Get Data dialog, under the Database category. The connector requires users to specify an Impala cluster server to connect to. Power BI Desktop will then attempt to establish a connection to the Impala cluster and will require users to provide credentials for the first-time connection. Both Anonymous and Username/Password credentials are supported. Subsequent attempts to connect to the same server will reuse the same credentials, as these are stored per-user per-machine. Users can modify the credentials from the Data Source Settings dialog (under File -> Options and Settings). Once the connection has been successfully established, users will be presented with the Navigator dialog where they can browse for tables within their Impala database. 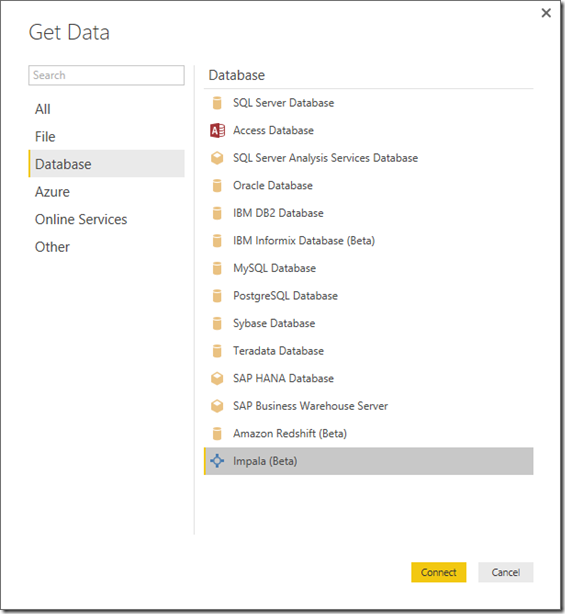 Users can select one or more tables and decide whether they want to load them straight into the Power BI Desktop local data model, or perform any data preparation and filtering steps prior to loading the data. Note that the connector currently only supports Import mode, which requires downloading the query output data to the local data model. 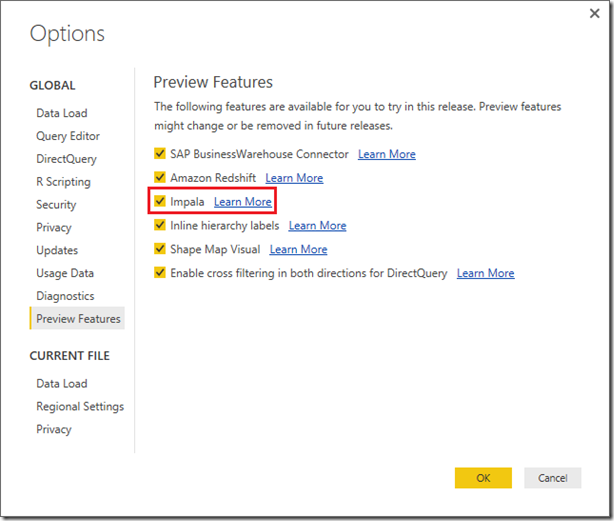 In future updates, we will enhance the connector with DirectQuery capabilities, as well as with support for refresh scenarios via the Power BI Gateway. 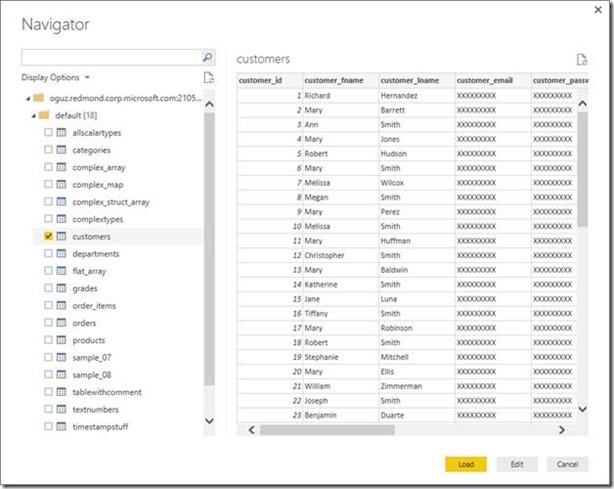 Enabling Power BI connectivity to Impala has been a very frequently requested capability from our customers. 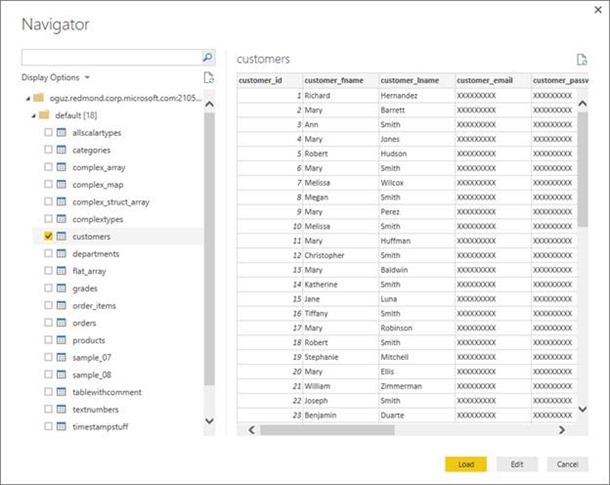 We encourage you to give it a try and share with us any feedback or issues that you encounter via the “Send a Frown” feature in Power BI Desktop. We’re looking forward to improving the Impala connector and to enabling connectivity to many other data sources in upcoming releases. If yours isn’t supported yet, just let us know.